It was one of those ordinary weekends. I was sitting right in front of my monitor, scrolling the recommended pages of YouTube. Suddenly, my eyes ware attracted to one video titled as ‘Chris Morris takes over Gujarat’. I clicked on it and re-watched Morris’s wonderful and ruthless batting display. He smashed Gujarat all around the park and scored 82 runs off 32 balls. I minimized that page and quickly and checked Morris’s stats, I got to know that he has 67 international wickets. Its gem to have such player in your squad shouted out loud inside my soul. After a while, I remembered one young rising all-rounder of Nepal who once told me that he wants to serve Nepal as how Morris is serving for South Africa. So I decided to write a short article on that courageous young star. The first thing that strikes you when he speaks is his clarity of thought. He listens carefully to every question, pauses and then answers calmly. And, he is only 15. We recognize him as ‘Narayan Joshi’. Bustling through the crease with a quick, whippy action, Joshi was one of the star performers during Nepal Under-16’s recent successful tour of Thailand. 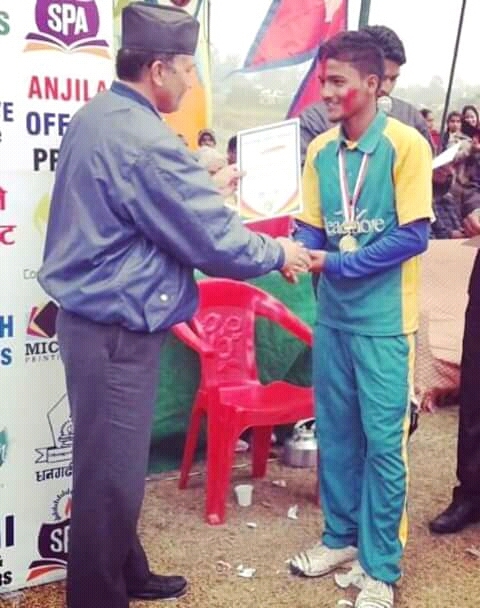 He picked up 11 wickets in Nepal’s successful campaign of ACC U16 Eastern Region tournament. In his very first trip outside Nepal, he started with a bang, picked up 5 wicket-haul against host Thailand. His quick fire 46(23)* has hinted us about his batting potential. Most of us may already know these things, hence I want to remind you of his very early days. He was born on 29th January 2003 in Dhangadhi. He is one of the few luckiest children to achieves both parents and best friend on same persons. His father, Tek Raj Joshi, and his mother, Maya Joshi are his biggest strength and motivator who never pushed him back of his dream. They always inspired him to do whatever he does. Growing up, he has two siblings, elder brother, Dambar Joshi and sister, Bhagwati Joshi. Quickly jumping ahead to his cricketing journey, it all started just four years back, when he was 11 years of age, he used to play tennis-ball cricket with local boys in street. Moving forward, he was part of his school’s team during Inter-school cricket tournament 2015. He was adjudged as the best fielder of the tournament, which changed his cricket as a fun mentality to cricket as a hone. Likewise, he represented his school during Inter-school cricket tournament 2016 as well. His dedication performance in it ended up with a scholarship for Dhangadhi Cricket Academy. Scholarship honored boosted up his dream more higher. Then, he started to train harder under the academy. Practicing under proper coaching panel modified his game and brought best out of him. He again participated in yet another inter-school cricket tournament. Pic Source – Narayan Joshi. With his skillful show, he procured player of the tournament. After then, he never looked back as he advances rapidly. He bagged 8 wickets in Far western’s U-16 national game. He participated in yet another U-16 national game and that time he was a captain of his side. Nepal cricket team head coach, Jagat Tamata lively watched that tournament and this courageous boy didn’t fail to impress him. Later on, he achieved one of four quotas for U16 national team camp from his region. As we all know, he was elected in Nepal U-16 cricket team squad and starting XI as well. Above all of this, he was recently picked in Dhangadhi Premier League (DPL) auction through talent-hunt. He was one of twelve players to be picked for DPL auction through the talent hunt. As we have been following him since a while back, his recent raise forced us to arrange a quick telephonic interview. What do you think about your chances to be picked by any franchise in DPL? – I’m adjudged in DPL auction through talent-hunt. I hope my hard work will take a flight through it. I think I have considerable high chances because of my representation in Nepal’s U16 cricket team. What’s your future plan, where we will probably see you in around 5 years? Who has the biggest role to make you what you are today? – My family is my biggest strength. Barring family’s member, one of my friend, Lokesh Bam always motivated me to give my best. Subash Shahi sir obviously has a great role in every Dhangadhi’s cricket players. – Obviously, Dipendra Singh Airee. Who’s your favorite overseas cricket players? – James Anderson, I watch his videos to work on my bowling. When it comes down to an all-rounder, I like Hardik Pandya. – Paras Khadka, he is a great role model for all of us. Which batsman of the international arena, you love to deliver a ball? – Paras Khadka and AB De Villiers. The dreaming boy from Dhangadhi may fulfill his dream of bowling to Nepal cricket team role model and captain very soon if he gets picked by any side. He has great potential to be on the national side and surely, with him and a bunch of cricket loving teenagers Nepal cricket is in safe hands.